P izza might not be the first thing you think of when you’re contemplating the finest food Pittsburgh's got to offer, but overlooking it would be a major mistake. 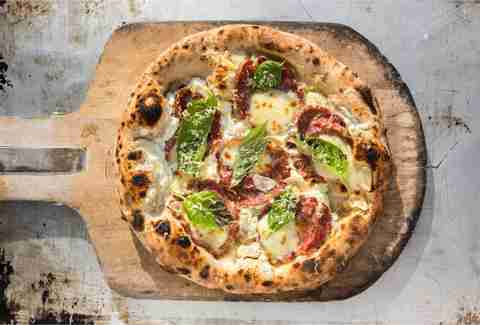 From hometown hole-in-the-walls to fancier Neapolitan eateries, you've got plenty of options for remarkable pizza experiences here are spots that are making the greatest pizzas in Pittsburgh. Pizza Taglio’s Greenpointer brings the heat, topped with mozzarella, spicy Calabrese sopressata, and a hot honey that’s been infused with chilies, so if you’re looking for something with a kick, you’ve found your perfect pizza match. Pizza Taglio’s artisan pies are Roman-inspired, with a light, impossibly airy crust, and each one is big enough to share... if you’re willing to share, that is. Pistachio pesto, Romano cheese, mortadella, burrata, and fresh basil all come together in a really good way on Piccolo Forno’s mortadella e pistachio pizza, which has just a hint of sweetness. 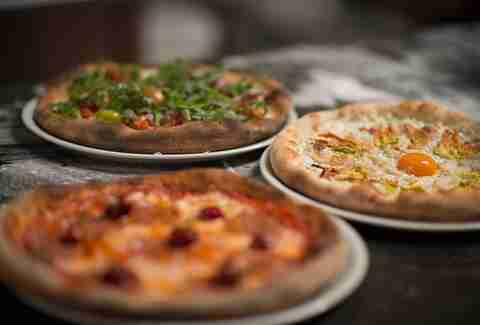 It’s just one of the more than a dozen wood-fired pizzas on the menu at this cozy, super popular Lawrenceville BYOB. Whatever you end up ordering, save room for dessert -- specifically, the Pittsburgh-famous tiramisu. Fiori’s motto is "we fix you up," which is appropriate since pizza can fix almost any bad situation. The floury dough is tossed by hand -- a feat you can admire for yourself through the large window near the door -- and there are a whole host of meaty toppings including capicola, Virginia ham, bacon, meatballs, steak, and hot-sausage links. Of course, Fiori’s pizza is just as delicious plain thanks to its sweet sauce, thick cheese, and puffy crust. For eat-in dining, order at the counter and wait for a seat to open up; it'll be bustling around dinnertime. Pittsburgh’s newest pizza place also happens to be one of its best. Iron Born Pizza is part of the second class of restaurants in the Strip District restaurant incubator Smallman Galley, and it's definitely earned its spot. 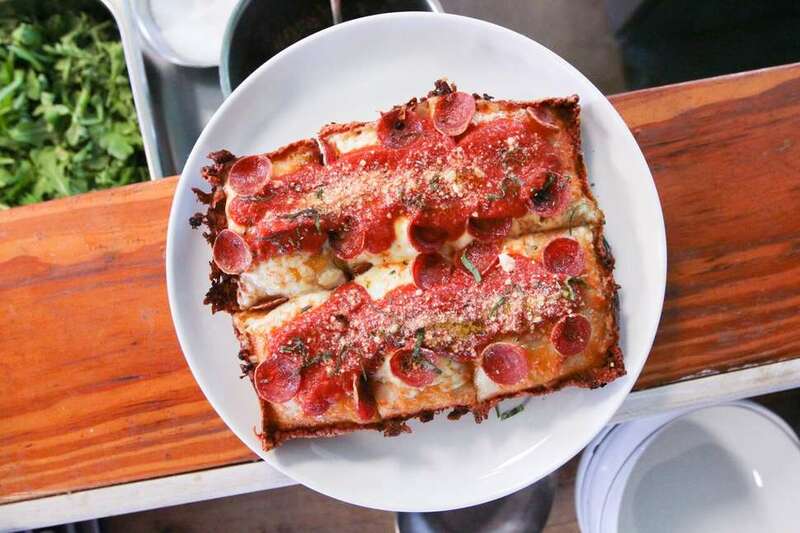 Chef Pete Tolman’s Detroit-style pizza is cooked in a personal-sized cast iron pan, giving the focaccia-like base a crisp crust and light, chewy interior. The specials menu changes frequently, but the red pie (with brick cheese, pepperoni, 24-month Parmigiana, and red sauce) and the white pie (garlic cream, caramelized onions, marinated cherry tomatoes, arugula, and ricotta) are always available, and always worth ordering. Driftwood Oven has been rolling around Pittsburgh since 2015, serving up fresh, wood-fired pies topped with ingredients that are sourced from local farms and change with the season. All the pizza from Driftwood starts the same way: with, well, a starter. The bread and pizza doughs produced from Neil Blazin and Justin Vetter’s mobile pizza unit are all hand-mixed with organic flours and a sourdough culture, which makes the dough rich and flavorful. Check out the website to stay up-to-date on where this movable feast will be. Mineo’s Pizza House has been a Pittsburgh classic since John Mineo opened his original Squirrel Hill shop way back in 1958. Though the business has grown over the years (there’s also a Mount Lebanon location), the family recipe that was used on the very first day of business is still what’s being used today. 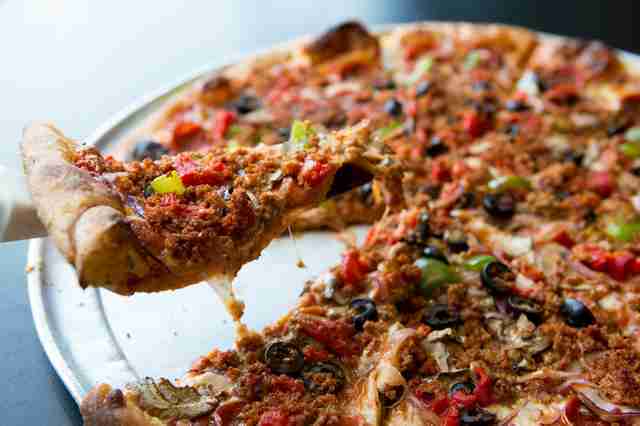 Go for John’s Special: Named for the man who started it all, the pie's loaded with pepperoni, mushrooms, onions, green peppers, and sausage. Ray Molinaro opened Il Pizzaiolo's flagship location in Mount Lebanon back in 1996, putting emphasis on sourcing the best ingredients possible. Fresh Buffalo mozzarella's imported from Italy for the restaurant’s classic Neapolitan pizzas, which are fired in a 1,000-degree oven; for our money, you can’t go wrong with the classic Margherita DOC, topped with fresh basil, San Marzano tomatoes, creamy mozzarella, and extra-virgin olive oil. At Dinette, crispy, wafer-thin dough is the foundation for light sauce and fresh toppings, some of which are actually grown on the restaurant’s rooftop. 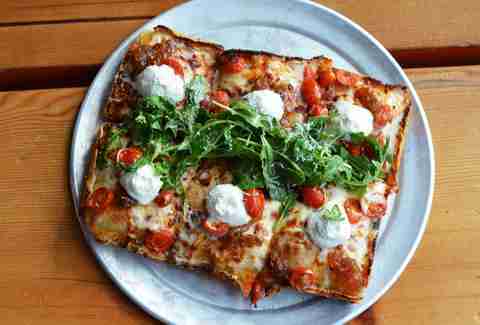 Dinette’s version of a “plain” pizza is essentially a margherita, but with spoonfuls of fresh, creamy ricotta; don't sleep on the savory prosciutto pizza either, with arugula, Parmigiano-Reggiano, mozzarella, and tomato. The restaurant is airy and open-concept, with bright white walls, big windows, and an unobstructed view of the kitchen and its chefs at work. This place is literally over the river and through the woods from Downtown, but it’s worth the drive for Nonna Pina’s Pizza, the “grandmother’s specialty:” a thick, square-cut pizza with Romano cheese and a chunky tomato-onion sauce. La Tavola has been serving up slices for 50 years, so the locals know how to find the practically secret take-out entrance -- for the uninitiated, it’s the unmarked door on the side of the building. Look for the wooden staircase. At Slice on Broadway, the cooks own up to having an abnormal obsession with pizza, and happily accept their label as perfectionists. Buy by the slice or by the pie (small, large, or "ginormous" with 16 cuts). There are 20 specialty pizzas, such as the Slaughterhouse Five, with pepperoni, sausage, bacon, capicola, and prosciutto, along with the dish’s motto: "Vegetarians need not apply." If you haven’t already heard of Beto’s Pizza (and, since it's been in business for more than 60 years, it’s hard to imagine that’s the case), this may blow your mind a little bit. The restaurant serves classic pies, with pizza dough topped with sauce pulled hot and fresh from the oven... then covered in cold shredded cheese and assorted toppings. These "raw" pies are a local favorite, and slices start at just $1.60, with toppings for an additional 50 cents. Order at the counter and take it to-go, or commandeer a booth in the dining room. 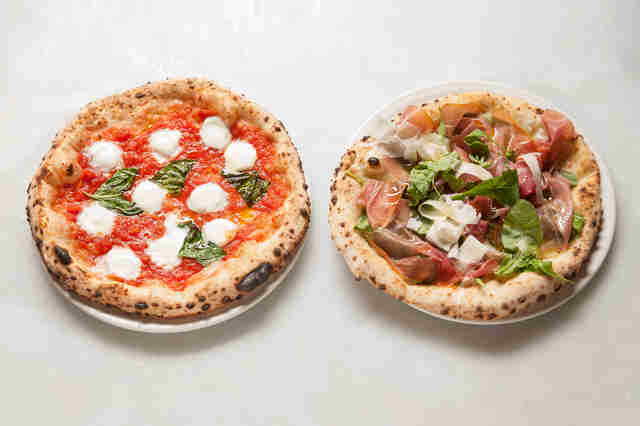 Proper has brick-oven pizzas down to a science. The thin dough begins with an organic yeast starter, which rests for three days, before it’s fired in a wood-burning oven transforming it into a crisp, smoky crust. 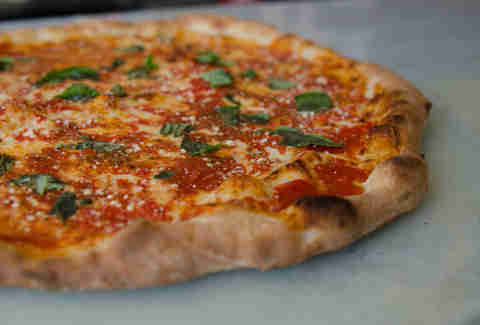 With fresh basil and house-made mozzarella, the margherita is a great choice. For more adventurous palates, try the Ocean (sautéed fresh clams and shrimp, roasted garlic spread, Italian parsley, Fontina, grated Parmigiano-Reggiano, and lemon) or the Pittsburgh-themed Black & Gold (crispy Yukon Gold potato, black pepper, red onion, roasted garlic spread, extra-virgin olive oil, and grated pecorino Romano). This hybrid café/deli/restaurant offers so many fantastic options -- from homemade pastas to fresh-baked pastries -- that ordering a slice might be the last thing on your mind. But, with its thin center and bountiful, chewy crust (and generously seasoned, slightly sweet sauce), the pizza here absolutely shouldn’t be missed; for $50, you'll also get a bottle of sparkling red wine to go with your pie. Spak Brothers is a crowd-pleaser with vegan options, plus plenty of choices for carnivores. Slices -- bubbly and big enough to fold -- are served on pieces of wax paper. On most nights, a line snakes through the shop, and punk or metal music blasts through the speakers. Bring along some coins to play the restaurant’s vintage pinball machines while you wait for slice after addictive slice. Emily Catalano is the creator of Good Food Pittsburgh, a site devoted to all of the good food that her hometown has to offer. She loves fries on her salad, Jalapeño Hannah, and any event with a cookie table. Follow her at @emcatalano. Rossilynne S. Culgan is a Pittsburgh native, but she’d rather be in Italy eating pizza. In researching this story, she ate seven slices of pizza in 24 hours, and it was like a slice of heaven.